Missing or damaged ridge tiles result from weathering which has caused the ridge tile to crack or the mortar holding the ridge tile to crumble. Rebedding or replacing ridge tiles is generally a straightforward job which can be completed in a day. Some of this time will be spent building and dismantling a safe access platform. A scaffold tower and a cat ladder ( also know as a roofing ladder which is designed for accessing inclined roofs and can be hooked over the ridge) will be required for a house. For a bungalow a ladder can generally be used. For a bungalow the figure should be no around £140. The challenge will be to find a roofing company who is willing to do a small job lasting a couple of hours. As a rough guide to materials, a half round clay ridge tile of 420mm length would cost around £5.00 and for concrete around £3.50. The ridge tiles will need to be fixed in a mortar bed to secure them and make them waterproof. On a single storey building the cost would be reduced by not using the access tower so would be around £620. For this price the ridge tiles should be removed and the roof tiles cleared of mortar before the new ridge tiles are rebedded in mortar. If the ridge tiles are in a condition to be reused then this will reduce the costs accordingly. When a roof is being refurbished, the ridge tiles will need to be removed to allow all the tiles or slates to be removed and a new breathable membrane to be installed. Assuming that all the scaffolding is in place for the re-roof activity then re-mortaring the ridge tiles would be included in the overall price. 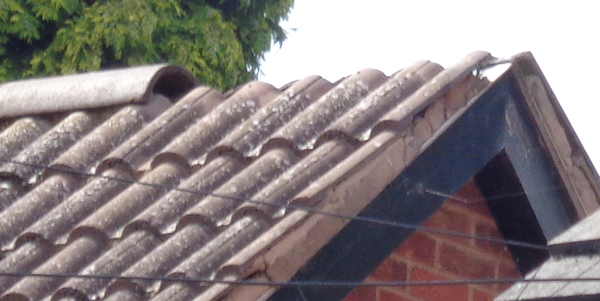 Do check that any replacement ridge tiles match the originals if they are going to be reused. My 3 bed detached house purchased 1973, built 1910,has been brought to a high standard since retirement. The roof is OK but a renewal by a reputable company is quoted at 18 k. I am 70 now.Whilst deliberating on this I was quoted 1,300 by a local tradesman to improved the appearance of the main pitched run of bonnet tiles which was ‘splodged ‘ many years ago .This task plus a little pointing here and there took under 5 hours . The bonnets have been re ‘splodged’ to the point where most are invisible. No tower or scaffolding was used.Labour was carried out by the Proprietor and an assistant.Retrospect tells me never shake hands on the deal , never pay until an itemised vat invoice has been submitted. I have been lucky for most of my time but retirement has brought about some softening of my business disciplines.Wake up Roger! Thanks Jon. I should have said on the first email, that I realise that you are not an advice centre!! But I thought you would know the parts of a roof and who is responsible for what since you are into building structures. If this is not an appropriate comment or question to ask, then I quite understand. I live in a pitched roof house, part of a terrace. The house next door, which is joined to mine with a hip joint and a valley between us, lost the two ridge tiles during a recent storm. The owner of that house has told me that replacing them is my responsibility. They have come off his roof line not mine. I would like confirmation that this is in fact true. I obviously don’t want to get water damage in my property. Is this a possibility? If they have come off his roof then how can it be up to me to replace them? I hope this is clear. Not an easy situation to explain for someone with little building knowledge or vocabulary!